The brightness of this collage belies what's outside my window today. Rain, rain, rain. Such downpours. Apparently the systems currently beleaguering our island are pulling moisture from the typhoons/monsoons in the Far East. It's certainly wet! Most of the photos in the collage were taken at Butchart Gardens this month; a few are from my own garden. Linking with Mary at the Little Red House for Mosaic Monday. Hi Lorrie, what lovely flowers. I am so bad with knowing names of flowers and in your mosaic, I can hoenstly say, I have never even seen any those before, other than the Hydrangea. They are gorgeous. Your bright and beautiful lovelies are making me miss already! And, it's not even my favourite season! Don't these pretty flowers just make you smile?! Are those orange mums, bottom, 3rd from right? They're my favourite! Lovely collection of beautiful flowers. They are all gorgeous, thanks for sharing. Have a happy week ahead! Oh those storms sound rough. Your collage is beautiful. With those kind of storms, it's so good that you captured those photos when you did. Looking at those bright flowers must brighten up your rainy days, at least a little. The colours are fabulous, Lorrie. Beautiful blooms in rich colours. The rain is supposed to return to Ontario again. Isn't it grim out there?! But dramatic, and not without a severe beauty. . . .and it's so great to be cozied up inside with cheery flowers on the screen, thanks. They are each different and beautiful. It's been a good year for flowers and thick green grass here this summer. I hope you have some sunshine peek out and warm you tomorrow! I wonder what the rain and wind are doing to the displays at Butchart? I didn't get back there, but I recall the colours of summer, especially those in the rose garden! More is coming - the heavy rain and wind is just hitting us - we are snuggled in for the night. Love the flowers.!!!! Lovely collage, Lorrie . . . Kari and Ken were on the island today for their grandbaby's shower and just made it on the last ferry home before they cancelled sailings. Oh my, Lorrie; the flowers in your mosaic are just spectacular!!! What a pretty mosaic you created, and your photography skills are awesome. :) I know the Butchart Gardens are amazing; my in-laws visited there several years ago when they went to Canada. I also had a piano teacher years ago who sent me a postcard from there. Hopefully I can visit someday, too. Your fire sounds very cozy! The temps. have been dropping here in the evenings, too. We can tell that fall is upon us. We will be prepared for another hot spell though, as we usually have an Indian Summer here in our state. Thanks so much for your visit; I hope you have a wonderful week!! You have had some beautiful flowers this summer Lorrie. I am still watering some of my pots as well...and they are looking pretty good yet. We have had 2 very windy days but no rain on the prairies. It is nice to feel a crispness in the air. Have a great week! Such pretty flowers for the end of the summer. Our recent draught about did ours in but a few remain. Hope you have a good week! What a lovely way to remember the last of the summer flowers. Your mosaic is so colorful and cheery despite what is happening outside your window. Our recent visit to the Butchart Gardens has left a lasting impression. What an amazingly beautiful place. Hope your rains stop soon. Beautiful photos and colours. Sad to see the end of the summer blooms isn't it. Mine got dried out over the weekend and look terrible so I watered them this morning. I hope they revive for another week. And I hope the rains stop for you! 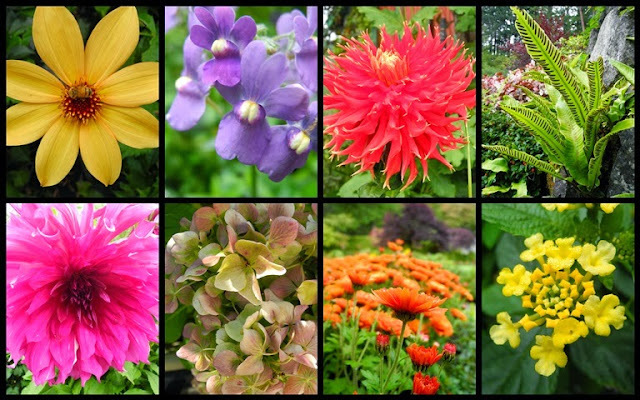 I could do a similar collage of single flowers from my garden, but there really isn't much in bloom. There are 3 mums that I planted last fall ready to burst into color any day now. What pure joy! Here in New Zealand we are just into spring and dreaming of what to get in the garden for summer. Love your collage...a bright splash of colour on this grey day! It may be goodbye to summer and summer’s splendours, but that doesn’t mean goodbye to colour. Once that rain has gone you will find autumn’s colours, not something I’d sniff at. They will soon be history! Thanks for sharing the digital bouquet with us! Nice and bright. Between the wind last night and the hail this morning, the flowers in my yard are in sad shape. My son-in-law informs me that Gabriola Island had winds up to 120kmph! What a welcome to autumn for our Island. Keep dry, Lorrie! Oh I needed those bright color spots! (It is pouring down rain nonstop here in Oregon too!) Thank you!! Gorgeous flowers! We have some summertime blooms left here, but this weekend storms have done a number on my roses:( Other then that, we are OK and the weather today a mixture of showers, wind, clouds and a bit--just a bit of sunshine and blue skies. Prayers have been and will continue going heavenward for your safety. Great mosaic and your flowers are beautiful. Have a great week. A wonderful floral mosaic Lorrie - you can look at it for a ray of sunshine during those dull Winter days. That hot pink dahlia is wonderful! Lol Pictures, Lol photos, lol facts, evey thing is in Lol Movements, Just Join this Network. Troll Images, Funny Vidoes, Prank Peoples, Funny Peoples, Prank Images, Fail Pictures, Epic Pictures, Epic Videos, Prank Videos, Fail Videos and Much More Fun and Entertainment, Lols and Gags, Lol Pictures, Lol Videos, Funny Pictures, Lol is the Laugh out of Laugh where you can Fun Unlimited and Laughing Unlimited. Your collage of flowers are absolutely gorgeous, and the colors make me happy to see! The last of your flowers out does mine at the height of the season! Beautiful!